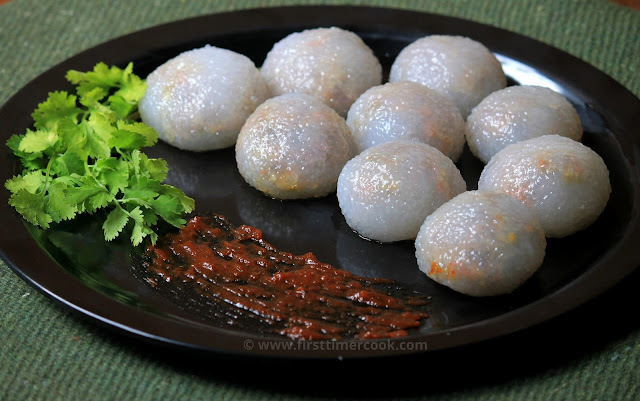 Sago dumpling or Tapioca dumpling - a popular thai street snack food made of outer layer of tapioca pearls. Instead of the commonly used minced pork in the dumpling, I have created a vegetarian version with sauteed veggies like cabbage, carrot and beans. 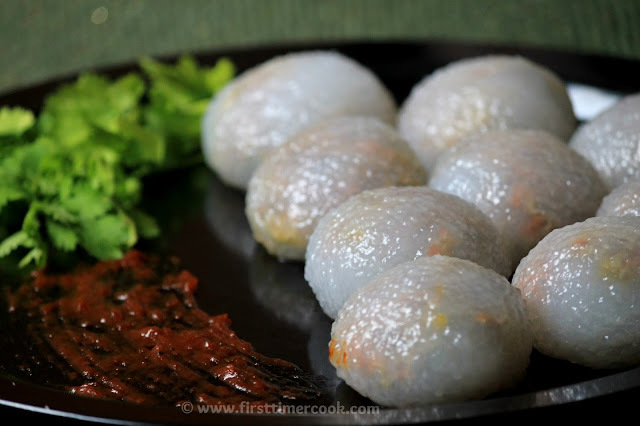 This is an easy recipe after you master the art of making the circular discs of tapioca pearls and bringing the sides together to wrap up the filling within. Remember that the wrapped tapioca flour should be thin but firm, like explained in the procedure below. These dumplings have a good balance of strong seasoned filling and a bland wrap (of sago). 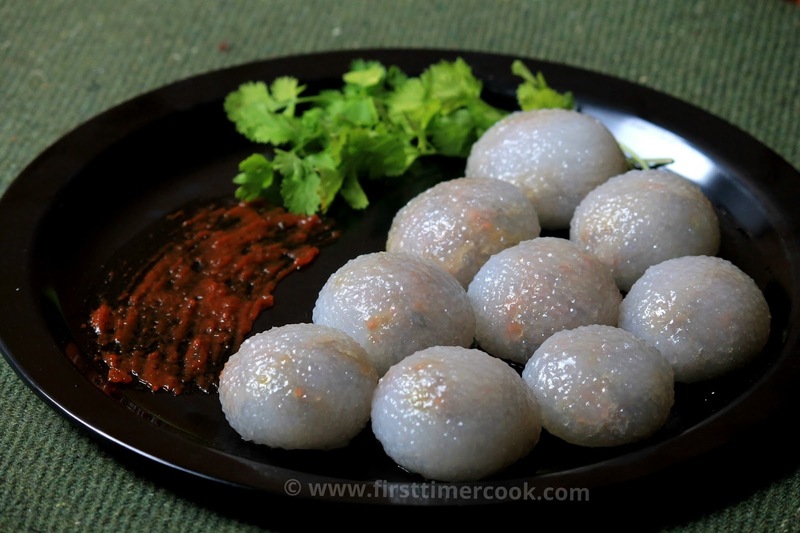 Vegetarian sago dumplings can be served during evening, along with drizzled garlic oil and soy sauce for snack. Soak sago / tapioca pearls in room temperature with 1/2 cup of water. It takes at least 15-20 minutes to get the sago into a workable stage. Mince garlic, cilantro roots. Add finely chopped onion and mix together. Put a pan / wok over medium flame and heat oil. Add the minced mixture, stir until the onion is translucent. Next add finely chopped cabbage, carrot and beans. Stir well to mix everything together. Add soy sauce and pepper powder. Stir and mix all the ingredients well. Switch off the flame, the filling is ready. Keep aside and let the filling cool down completely. Meanwhile, take all the soaked sago in a bowl, knead until very pliable (for 2-3 minutes) and make a smooth dough like flour dough. Take a small amount of dough in wet hand, flatten and make a disc shape (around 6 cm). Place 1 tsp of the filling in it, then close the flattened disc carefully and give a round ball structure. Keep the ball on a lightly oiled plate. Repeat the process with the remaining dough and the filling. Now ready the steamer for cooking these balls. Before placing the balls in the steamer, brush the steamer plate with oil. Steam them for 15 minutes or till the sago becomes soft and transparent, basically depends upon the thickness of the wrapping. Remove the dumplings (steamed balls) from the steamer by dipping a spoon into the oil in order to prevent the dumplings from sticking to the spoon. Brush each dumpling with garlic oil (Garlic oil - fry 1 tbsp of crushed garlic in 2 tbsp oil till golden brown). Garnish with fresh cilantro, serve immediately ! Tapioca Pearl Dough is too sticky– Avoid hot water to soak the pearls, otherwise the dough become too sticky. Water at room temperature is the best. If the dough seems too dry then sprinkle some water and knead again. If the dough seems waterlogged, add few amount of soaked tapioca and knead again. For perfect dough always keep the ratio of tapioca pearls to water is 1:1. These dumplings can be kept in the fridge for 2-3 days. Just before serving, reheat the dumplings in the microwave or steamer. Instead cilantro roots, thicker stems of fresh cilantro can be used. Prefer to dip hand into water before handle the dough. If the dumpling breaks during cooking, then the wrap (made from tapioca dough) is too thin. So be careful while making the wrap, it should neither thick nor thin.